We all know that Comic readership is essentially divided into two camps–the mainstream adventure genre devotees who hang out on the north side of the store and the Independent comic readers who huddle in the south-east corner under the shade of Manga Mountain. Granted, there is a significant number of readers who saunter back and forth between the two enemy camps, but the majority of us prefer to stay put in our comfort zones. Now I don’t read superhero stories very often. I was once a huge fan in the mid to late eighties; then I ventured outside the Superhero Universe and into Indie Island. Occasionally, some good folks recommend (insist actually) that I dip my toe back in the deep end of the spandex pool and suffice to say, most times I find the water quite refreshing. So I want to see if I can return the favor to all you dedicated Cape and Mask folks out there. Now on any given day and twice on Wednesday, we Indie folks do our evangelical best to get everyone and anyone to read Love and Rockets. It really is a great, great book, but perhaps a comic about the day to day struggles of an over-weight middle aged female apartment superintendent and her friends and ex-lovers is not for every taste. 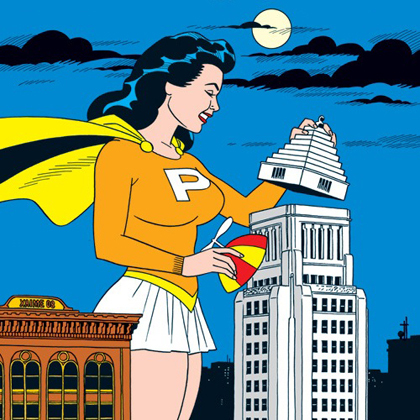 But what if the talented Love and Rockets cartoonist, Jaime Hernandez, created an absolutely delightful superhero story filled with adventure, fun, and lots of pretty girls with tons of super-powers? 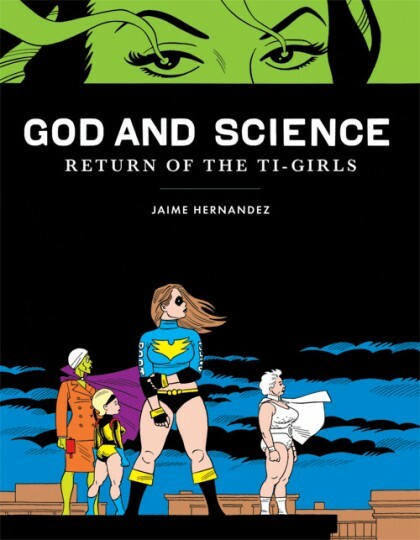 God and Science: Return of the Ti-Girls is that book and it is one I wish every DC, Marvel and Image super-hero fan will pick up and read. Now only a fool of a critic would describe a comic in such hyperbolic terms as “every single panel of every single page is chockful of artistic delights and clever storytelling”. But you know me, so all I can say is, every single panel of every single page is chockful of artistic delights and clever storytelling. In addition, God and Science spotlights one of the top five most attractive female characters in comic history*, Penny Century, as she struggles with her newly found super-powers and searches for her two missing (super) children. The story is fun, exciting, fast paced and way over the top, but it is not a satire of superheroes. The difference between Jaime’s work and a genre parody is one of tone. God and Science is a genuine love letter to super-hero comic books. The theme of the book focuses on the importance of comic books in our lives, and Jaime drives this home by suspending our disbelief and taking us on a whirlwind ride. It is a pure delight and I cannot recommend it any higher. So for all you who are willing to give this little masterpiece a try, I’d just like to say (in advance) …You’re very welcome! Enjoy!! *--The other four most attractive characters are Dave Steven’s Bettie Page from The Rocketeer, John Romita‘s Gwen Stacy (or MJ), Darwyn Cooke’s Silk Satin and Steve Rude’s Sundra Peale from Nexus. Any list you come up with might equal, but can never beat this list.